In dining rooms or kitchens all around, the divine aroma of this breakfast bliss is sure to set your mouth watering. 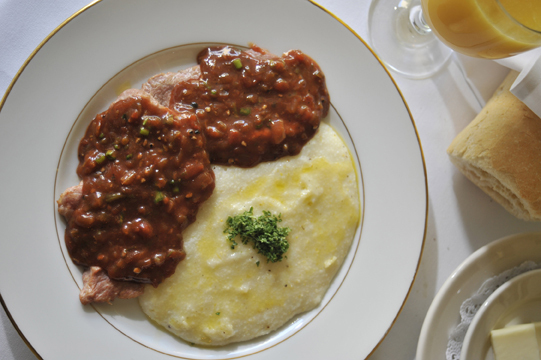 A traditional brunch in New Orleans, grits and grillades is one of the most delectable of the classic breakfasts in that city. To make this lovely smothered steak (sounds like gree-yards) even more enticing, serve it next to cheese grits. Most recipes call for veal round pounded lightly and smothered in its natural juices. But veal is not as readily accessible as it used to be, so if you can’t find it, get beef rounds or round steak. I always use a Creole seasoning mix; you can use a commercial product like Tony Chachere’s, or use the one from my “Etouffee” blog. If you like it, make more and keep in a jar. 4 breakfast steaks, veal or beef rounds, tenderized with a meat mallet. Sprinkle 1 teaspoon of the seasoning blend over both sides of the meat, rubbing it in thoroughly. Put in a bag or a flat dish, the flour and 1 teaspoon of the seasoning blend, mixing well. Dredge the meat in this flour blend and set aside. Heat the fat over medium-high heat in a heavy skillet and sear the steaks swiftly, only just browning the surfaces for now. Put two tablespoons of the blended flour to the fat in the skillet and start stirring constantly with a wire whisk or wooden spoon to make a brown roux. Watch as you are stirring the roux, when it starts to turn a nice brown, be ready for the next step. Put in the trinity (onions, celery and bell pepper) plus the garlic. Stir well a few minutes to soften the vegetables. Stir in the tomatoes, wine and Worcestershire sauce, cook for a minute. Add the stock, tomato paste, thyme, and scallions and remaining seasoning mix, stir thoroughly. Lower the heat; simmer gently for about one hour. When done, the grillades will be very tender. You can serve the grillades with buttered grits, but these cheese grits are particularly good. Bring chicken stock to boiling in large pan. When boiling, stir in the grits, salt and pepper. Return the pot to boiling, then reduce heat to low, cover and cook 15-20 minutes, or until grits have thickened. When thickened, remove from heat and mix in the butter, egg and cheese. Grits are good groceries, and with grillades become great. Enjoy. I love your take on the A-Z challenge. It is a refreshing and delicious change of the majority of postings I have seen so far! Thanks for the recipes! :) mmmmm! The taste of the south.